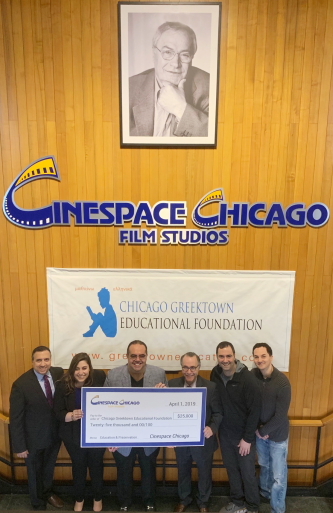 Cinespace Chicago Film Studios will donate $25,000 to enable Greek schools to modernize curriculum and enhance student participation, as announced by the Chicago Greektown Educational Fund (CGEF). The announcement renews support from CGEF’s “Nick Mirkopoulos Scholarship” partner one year after which it was established. This year’s donation will support students at seven Greek schools in the Chicago area and one Greek school in Merrillville, Indiana to engage in their Greek studies with the help of iPads, smartboards and software specifically developed to teach the Greek language to young people. Since the founding of the Chicago Greektown Educational Foundation in 2014, its mission has been to support Greek language educational and cultural initiatives using technology and it has donated more than $100,000 to regional Greek Schools. Cinespace Chicago Film Studios supports several local charities and foundations. Cinespace is also home to two of its own nonprofit organizations, CineCares Foundation and Stage 18 Chicago. For more information on the impact that Cinespace is having on the film industry in Chicago and the economic development of the North Lawndale community, visit the website at Chicagofilmstudios.com or follow its social media channels. For more information about the Chicago Greek Educational Foundation or to make a gift to the “Nick Mirkopoulos Scholarship” please visit www.greektowneducation.com. Cinespace Chicago Film Studios is a family-owned company specializing in the development, management and operation of studio space and support facilities for the film, television, and digital media production industry. With 31 sound stages on its 1.45 million square foot main campus in Chicago’s North Lawndale neighborhood, and additional studios currently under construction at 31st and Kedzie, Cinespace is the largest film studio outside of California. Since opening in 2011, Cinespace has helped bring more than 16,000 new jobs to the area. As part of Cinespace’s commitment to the neighborhood, the family established CineCares Foundation to train and employ area residents through education and job training in TV & Film. The CineCares Foundation Mirkopoulos Internship Program partners with NBCUniversal, Wolf Film, Fox, and Studio Mechanics Union Local 476. In addition to film production, the campus is home to Stage 18 Chicago, a 501(c) 3 organization and incubator established to retain and grow talent in Chicago. Key tenants at Cinespace include 312 Fast Draw, AbelCine, Cinelease, DePaul Film School, Keslow Camera, Lagunitas and Periscope Post & Audio. For more information or to contract studio or business space at Cinespace, visit the website at ChicagoFilmStudios.com. Send your community updates to Reel Chicago Editor Dan Patton, dan@reelchicago.com.